State schools exist not only in a variety of forms, but with nuances between those. Some areas continue to have a selective system at 11; others do not. Most secondary schools – and quite a few primary schools – are now academies. Plenty of these are part of large academy chains such as Harris Federation, E-Act or ARK. Other schools are free schools, set up by local groups, often with a faith designation. These are all state schools, funded by the government, but academies and free schools are not overseen by local authorities. Controversially, they are permitted to employ unqualified teachers, set their own admission criteria and ignore the national curriculum.. However, worry less about the type of school - there are good and bad within all - but look instead at the individual school and how well it will suit your child. It’s a nerve-wracking time, deciding where you would like your child to take his or her first steps into school. A good state primary school will not only launch your child into a happy and fulfilling education journey, but also engage you in the local community. The friends you and your child make there are likely to be long-standing ones. Primary school admissions – what is the process? You must apply through your local authority for a place at a primary school, even if it’s linked to your child’s current nursery. Normal primary school admissions are at 4+ into the reception class. Applications open on different days in each local council area - usually at the start of the autumn term of the year before your child is due to start school. Check your local authority website for details of the catchment area for primary schools nearby, faith requirements and key dates. Primary school appeals – do I stand a chance? The harsh reality is that you have very little chance of success at appeal for a reception place, especially if you live in a crowded city. Firstly, because local authorities have a duty only to provide a place at a school, not at a school of your choosing. And secondly, infant class size legislation restricts classes to 30 children in reception/KS1. On Tuesday, 16 April, parents in England found out the primary school where their child has been offered a place for the start of the new academic year in September. All children born between 1 September 2014 and 31 August 2015 are eligible for a September school reception place. The Good Schools Guide predicts that although the majority of children will be given a place at their first-choice school, many will still miss out. You are not ‘free to choose’ the state secondary school you want your child to attend, but you can ‘express a preference.’ Those already in a school may not need to apply formally for places in year 12, but admissions criteria must be the same for both internal and external applicants and should detail any entry requirements eg number and quality of GCSE passes. Schools that offer a wider range of courses can state what courses are available, the entry requirements for each, and how priority for entry to these courses will be determined if they are oversubscribed. Secondary school admissions – what is the process? For a place at secondary school, you must apply through your local authority, even if it’s linked to your child’s current primary school. Normal secondary school admissions are at 11+ into year 7. Applications open on different days in each local council area - usually at the start of the autumn term of year 6, though for most grammar schools you will need to register for the entrance test during the summer term of year 5. Secondary school appeals – do I stand a chance? Despite all you’ve heard about competition for places at the secondary school you want for your child, it’s still a huge shock when your offer comes through for Unpopular Academy instead. Don’t despair - you have a legal right to appeal to any school named on your preference form. But it’s vital to have a back-up plan alongside going through the appeals process. The Good Schools Guide has been helping parents choose the right school for their children for more than 30 years. Here are our top tips and pitfalls to avoid on your secondary school application, which is due to land with your local authority by 31 October. Northern Ireland Education System The education system in Northern Ireland has some important differences to the one in England and Wales. Whilst the school year also starts in September, the child’s age on 1 July (rather than 1 September, as in England and Wales) determines when they start school and what school year they are in. 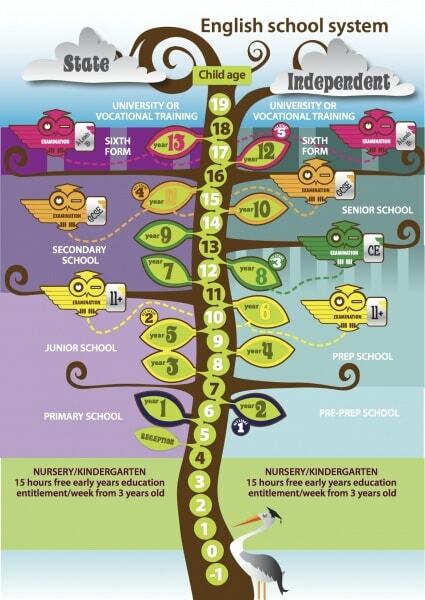 As elsewhere, children start primary school at 4+ and move on to secondary school at 11+. Scottish Education System The education system in Scotland is completely different from the rest of the UK. It is based on the Curriculum for Excellence which covers education from 3-18 years old. Children in Scotland usually start primary school in mid to late August when they are aged between four-and-a-half and five-and-a-half years old. Your child will be at primary school for seven years (p1-p7) before progressing to secondary school around the age of 11/12. Catchment area cheat Pressure for places in the UK’s best state schools is intensifying with state grammar schools leading the way. Popular schools see upwards of 10 applicants for every place. In 2014, almost half of children in some areas have been rejected from their preferred secondary school. Catchment areas are already shrinking as parents who had planned on private schooling join the battle for places in the best state schools. Inspection reports from Ofsted As with most reports, there’s a code to decipher and a few questions to ask. The local school gets a glowing report, yet you know half the population are banned from the shopping centre. Puzzling? So just what do inspection reports tell us and have they any value? The answers are lots, and yes, if you know how to read them. Understanding the British school system Normal primary school admissions are at 3+ into the nursery or 4+ into the reception class. Some are divided into infant and junior schools, the latter starting at 7 years. Most secondary schools start at 11. For a normal application, you will need to apply – with a local address - by around mid-January for primary schools and the end of October of the year before entry for secondary schools. When to put your child’s name down for a school A handful of schools literally demand that you apply for a place as soon as your child is born, which means it’s never too early to start planning your child’s education. In fact, it’s a process that can start even before you’ve conceived – and that goes for all parents, wherever they want their offspring to go to school.